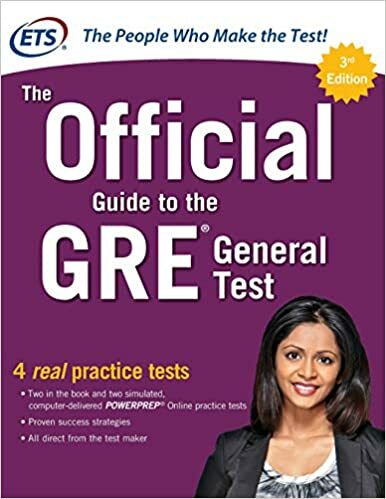 The GRE review is designed to familiarize the student with the various aspects of the Graduate Record Examination. This course presents an overview of the structure of the test and the format of the questions. The review focuses on successful techniques for both the Verbal and Quantitative sections of the exam. The verbal review emphasizes strategies for answering all types of questions- reading comprehension, text completion, and sentence equivalence. A thorough mathematics review is presented emphasizing the rules and formulas needed from the areas of arithmetic, geometry, data analysis and algebra. Additional practice in these areas is gained by applying these principles to both quantitative comparison and discrete quantitative types of questions that appear on the mathematics portion of the test. UCF-Test Prep only provides test preparation review courses and does not provide registration for the actual exam. Please visit the GRE-Exam Administration Site (ETS) to get more details on the exam you are interested in or to register for this particular exam. Take a free practice exam from the official testing organization. A diagnostic test with an answer key and answer explanations. A verbal reasoning review with practice questions in sentence completion and reading comprehension. An analytical writing review with scoring guidelines and practice exercises. A quantitative reasoning review that includes general math strategies, discrete quantitative questions, quantitative comparison questions, and data interpretation questions. Two full-length model GRE tests with answer keys and answer explanations. Verbal Reasoning - The verbal section includes two new sentence completion types: sentence equivalence questions, for which test takers must identify two correct answers to receive credit; and text completion questions, some involving passages of several sentences and requiring test takers to fill in up to three blanks. Reading comprehension questions may now have more than one correct answer. Some reading questions will involve selecting individual sentences with passages. Quantitative Reasoning - This section contains standard multiple-choice questions, as well as quantitative comparison questions. Looking to offer a review program on-site? "Bringing UCF to You" with convenient, discounted on-site review courses provided in various, flexible course format options. Whether you would like to offer your own private course or be able to provide a special discount to your students, UCF Test Prep is here to assist you in making your students successful. We bring the most comprehensive and affordable training to your location for your students. The transfer policy applies only to the Test Prep review courses in the subject areas of GRE, GMAT, FTCE and ACT/SAT courses. For transfers related to MCAT/PCAT/OAT/DAT or LSAT courses contact our office at 407.882.TEST (8378) as all MCAT/PCAT/OAT/DAT and LSAT course transfers will need to be handled on a case-by-case basis. UCF Test Prep Administration will approve all transfer requests, and notify the student of the decision and any pertinent information. Instructors do not have the authority to make decisions on this policy. Notification to instructors does not constitute transfer from the class. The required UCF Test Prep Transfer Request Form must be completed and submitted for review. Complete the transfer form: You, the student, must notify the Division of Continuing Education that you wish to transfer from the registered course. Download the transfer form from the UCF Test Prep website. This first step in the process is the most essential. We will consider your transfer request active on the day and time that we physically receive the signed form. Any transfer forms received outside of our regular business hours of Monday thru Friday, 8:00 AM to 5:00 PM will be considered "received" on our next regular business day. Payment: There is a payment required for transferring to another course. A percentage of your registration fee is applied as a credit to the new transfer course. The credit is determined based on how much of the course is remaining, and not on how many classes that you have attended or missed. We determine the remaining time for the course from the point in time we receive the transfer form, not from the time it is dated and signed. Only class times that meet after we receive the transfer form will count as remaining course time. The credit is applied to the current registration fee of the course being transferred to, and any remaining balance will need to be paid by the student. There is also an additional transfer fee of $50.00 (fifty dollars) that is added to your registration fee. The $50.00 transfer fee is required to be paid regardless of how much the credit is. Then subtract the number of hours the course has met (ex. 2 class meeting at 4 hours each equals 8 hours that have met). The remaining amount of class is be divided by the total number of hours for the course (ex. 16/24 = 66.7%). This percentage of your fee is applied to the registration fee transfer course. Sample: Orlando was taking the 16-hour review course, but after two class meetings Orlando decided that he wants to transfer to the 24 review hour course. Orlando paid $575 for the 16-hour review course, and the 24-hour review course fee is $700. How much will the credit be and how much will he need to pay? Orlando's class meets for 4 hours each session and there have already been 2 class meetings, so 8 hours of the course have already met, and 8 hours or 50% of the course remains. Orlando will receive a credit for 50% of his $575 registration fee that will be applied toward the $700 registration fee for the transfer course. After the $287.50 credit is applied, Orlando is left with a $412.50 registration fee. Once the $50.00 transfer fee is applied to the remaining registration fee of $412.50, Orlando will need to pay $462.50 for transferring into the 24-hour review course. Special Notes: Transfers for LSAT and MCAT/PCAT/OAT/DAT will be handled on a case-by-case basis, please contact our office at 407.882.TEST (8378). No portion of your registration fee can be applied to another DCE program or transferred to another person. UCF Test Prep will not refund textbook purchases, nor will we supply the textbook for the transfer course. I have been accepted into the University of Florida's Doctor of Education (EdD) program in the Department of Educational Administration & Policy. Thank you for the excellent teaching which allowed me to pass the GRE test. Without doing so I would not be getting ready for this exciting new chapter in my life.